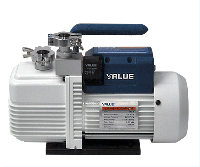 The RVP Series line of quality rotary vane pumps will meet your demands for high pumping speed combined with high ultimate vacuum. 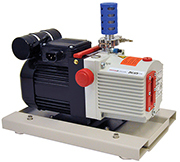 These dual stage rotary vane pumps are reliable, efficient and competitively priced. High quality engineering has resulted in corrosive-resistant pumps with a compact design coupled to quiet and low vibration operation. 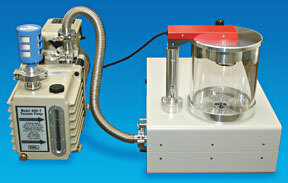 These pumps are ideally suited for many applications in labs and small production systems such as analytical instruments, electron microscopes, sputter coaters, carbon coaters, vacuum deposition systems, freeze drying, vacuum ovens and furnaces, or as backing pumps for high vacuum turbo or diffusion pumps.